From New York to Hoi An, Yin is in. 30 years ago, when I first started to practice yoga, nobody had ever heard of Yin Yoga. Neither the name, nor the practice, at least in its present-day form, existed yet. Although yoga itself has been around for thousands of years, it’s only been a few years since Yin Yoga first appeared in our studios. But it’s not love at first sight for everybody. Holding a pose for an extended period can be pretty challenging. Trying to stay with your comfortable edge while your tight hips are talking to you, can be as hard as sitting in meditation. That’s both the challenge and the appeal of this practice. Let’s take a closer look. Yin Yoga is a slow-paced practice of long-held floor poses that target the deep connective tissue of the body, the fascia. A continuous web-like tissue, the fascia wraps around and connects layers of muscle, nerve, bones and our inner organs. The long holds of Yin Yoga lengthen the fascia, keeping it healthy and pliable. It is also a way of activating the invisible energy pathways, the meridian lines, which according to the ancient wisdom of Traditional Chinese Medicine that informs Yin Yoga, run through the body’s connective tissues. Unlike the dynamic styles of Ashtanga, Hatha, and Vinyasa Flow, which are designed to build muscular strength, flexibility and stamina, Yin Yoga is designed to release, rather than work the muscles. It’s a more internal, passive and cooling practice. But make no mistake, being slow paced, does not make this a restorative practice. Poses are typically held between 3 to 5 minutes, even longer by very experienced practitioners. That’s long enough to become fidgety and cranky with your teacher for keeping you out of your comfort zone and in close contact with your monkey mind. Have you ever caught yourself thinking “This is too slow for me.” Or “When will this be over?” during a Yin class? Don’t worry, you are not alone. Just like meditation can be hard to master, Yin Yoga can be difficult to get into, because it’s also a mental challenge. Yin Yoga is as much a physical practice of releasing tight muscles and joints, as it is a contemplative practice in stillness and mindful awareness. While in fast moving yang styles like Ashtanga, we connect movement to breath, in Yin Yoga, we release consciously into a pose, staying present to whatever arises. This includes not just the physical discomfort of staying with our first edge. It’s also the mental discomfort of watching, from close up, our tendency to react and to judge, to be impatient and restless. Finding stillness of mind and body and staying with it for an extended period of time is what makes Yin Yoga such a deep practice. To go even deeper, in my workshops and retreats I combine Yin Yoga with mindful journaling and sound bowl meditations. All of which are forms of deep listening. The practice is based on the Taoist concept of yin and yang. Yang, the white swirl in the yin-yang symbol is masculine, left-brain, logical, high energy, changing, productive. Yin, the black swirl is female energy, intuitive, reflective, passive, stable, un-moving. In the body, blood and muscles—the mobile and pliable parts of the body—are yang, while the stiffer connective tissues such as the tendons, ligaments and fascia, are yin. The practice derives from the ancient Chinese healing art form called Tao Yin. Some 2000 years ago it was taught to Kung Fu practitioners by Taoist priests to activate the ch’i flow, the body’s internal energy, and to create balance between internal and external energies. It was a modern-day martial arts teacher and champion, Paulie Zink, who introduced the practice to the west in the late 1970s. A decade later Paul Grilley, a student of Zink’s, began to teach it, in line with the principles of Chinese Traditional Medicine, to activate the pressure points in the body which raises the body’s ch’i flow. Sarah Powers, who first practiced with Grilley, developed this yoga style further by combining it with Buddhist insights and mindfulness. She’s also credited with coining the name ‘Yin Yoga’ to differentiate this practice from the more energetic yang yoga styles such as Asthanga, Hatha and Vinyasa. Yin Yoga is a great complement to more energetic styles of yoga and other forms of physical exercise, like running or cycling, that work the muscles. By working on the meridians of the body, activating ch’i flow, Yin Yoga helps to nourish our internal organs and the denser tissues of the body with vital fluids. The practice can also give you greater range of motion, improved joint mobility and flexibility. The most important benefit of Yin Yoga, no doubt, is that it helps to release deeply held tension not just on a physical level but also on an emotional and mental level. The practice activates our parasympathetic nervous system, allowing us to rest and digest, making this a deeply healing and nourishing practice. By focussing on our breath in an effort to tune out of the constant mental chatter and our negative thought patterns as we hold the poses, we are also developing mindfulness skills that will serve us both on and off the mat. 30 years ago, when I first started to practice yoga, we didn’t have mobile phones or even email. Can you imagine? But we already felt the need to slow down. Yin Yoga is so popular today, because like mindfulness it asks us to slow down and to become grounded in the present moment. It teaches us to switch from busy ‘doing mode’ to quiet ‘being mode’. And that’s what our busy and distracted world desperately needs. Kerstin Pilz, Phd, 200 RYT, is a former academic, writer, trained yoga teacher and founder of Writeyourjourney. She is based in Hoi An, where she runs a weekly writing group and regular retreats that combine writing, yoga and sound bowl meditation. Through her website she offers online courses on mindful journaling and downloadable guided sound bowl meditations. Connect with Kerstin on her website, Facebook and Instagram. 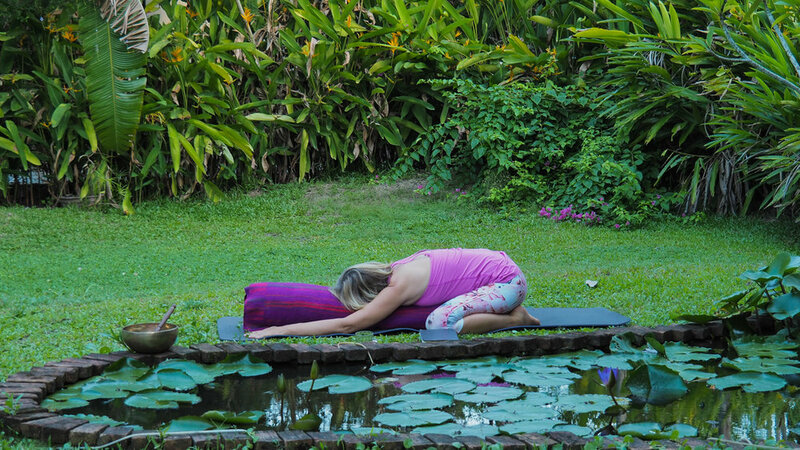 Join Kerstin in Hoi An, Vietnam for a 4-day or 7-day Writing, Yin Yoga & Sound Bowl Retreat in 2019.